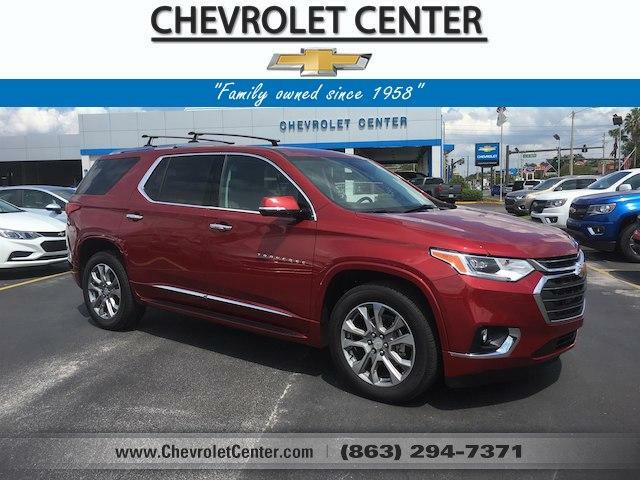 Heated Leather Seats, 3rd Row Seat, NAV, Sunroof, Power Liftgate, Rear Air, AUDIO SYSTEM, CHEVROLET INFOTAINMENT. DRIVER CONFIDENCE II PACKAGE, SUNROOF, DUAL SKYSCAPE 2-PANEL POWER, ENGINE, 3.6L V6, SIDI, VVT, Alloy Wheels. SUNROOF, DUAL SKYSCAPE 2-PANEL POWER with tilt-sliding front and fixed rear with sunscreen, LPO, 'HIT THE ROAD' PACKAGE includes (VLL) Black or (VQP) Bright roof rack cross rails, LPO and (VXW) molded assist steps, LPO (Includes (VQP) Bright roof rack cross rails, LPO. DRIVER CONFIDENCE II PACKAGE includes (UHY) Low Speed Forward Automatic Braking, (UEU) Forward Collision Alert, (UHX) Lane Keep Assist with Lane Departure Warning, (UE4) Following Distance Indicator, (UKJ) Front Pedestrian Braking and (TQ5) IntelliBeam headlamps, CHEVROLET INFOTAINMENT SYSTEM with Navigation and 8 diagonal color touch-screen, AM/FM stereo, includes Bluetooth streaming audio for music and most phones; featuring Android Auto and Apple CarPlay capability for compatible phones (STD), TRANSMISSION, 9-SPEED AUTOMATIC (STD), VVT (310 hp [232.0 kW] @ 6800 rpm, 266 lb-ft of torque [361 N-m] @ 2800 rpm) (STD). Includes (VLL) Black or (VQP) Bright roof rack cross rails, LPO and (VXW) molded assist steps, LPO; (Includes (VQP) Bright roof rack cross rails, LPO.